For my first guest post for Excavated Shellac, I’ve chosen a recording of Parisian accordion music by Charles Péguri. Since this is my first (but hopefully not last) guest post, I wanted to pick a disc that is interesting on many levels. First, it’s good music, which always seems to be the number one prerequisite for a record to appear on Excavated Shellac – obscurity never is an end in itself. That being said, as a record nerd I also love all the strange and obscure early French record labels like Disque Aérophone. There seems to be no end to their bewildering variety. This disc also highlights one of the newest collections to come to the UCSB library, where I curate the collection of historic recordings. Charles Péguri (1879-1930) is the accordionist and composer who is credited as one of the inventors of the musette style of French music popular in the late 19th and early 20th centuries. The musette, a type of bellows-powered bagpipe from the Auvergne region of central France became popular in the Bal-musettes, small Parisian dance halls that catered to the Auvergnat immigrants in Paris in the late 19th century. Later, when Italians like Charles Péguri (whose father, an accordion maker, emigrated from Piedmont in the 1870s) brought their accordions to the dance halls and began playing the traditional minor-key dance forms, one of the world’s classic forms of accordion music was born. Piétro, performed and probably written by Péguri, is an example of this quintessential style of Parisian accordion music that can still be found being played by buskers in the Paris Métro today. 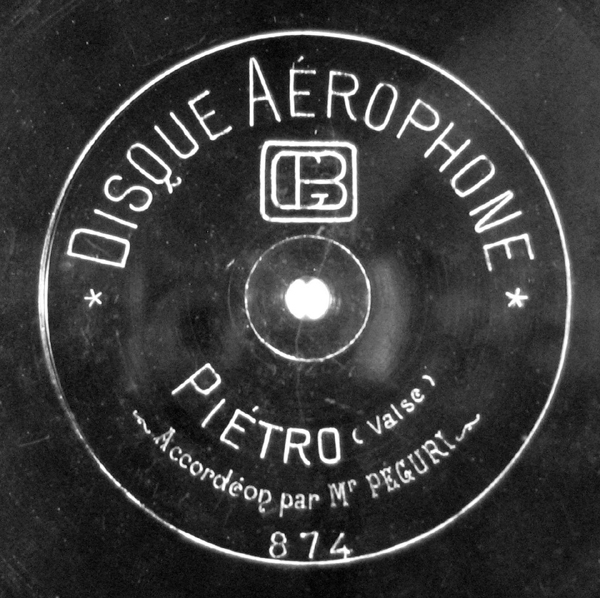 Musette records remained popular through the 1940s, but this early example on Disque Aérophone dates from around 1911. All the Aérophones I’ve seen, including this one, are 27 cm (10 3/4″) discs. Some have paper labels and some have etched labels. Surprisingly (or not, since Aérophone was a French company), some Aérophones like this one are lateral cut and others are vertical. Aérophone discs aren’t common, but they aren’t impossibly rare either. This and about 20 other Aérophones are a recent acquisition by UCSB and are part of the Bruce Bastin/Interstate Music collection. Folklorist Bruce Bastin founded Interstate Music in the 1970s to reissue folk, jazz, country, blues, and ethnic recordings on LP. Over the years, he issued some 850 compilations on LP and CD, featuring music from The Americas and the Caribbean, Europe, Asia, and Africa. His compilations of ethnic music primarily appeared on his Harlequin and Heritage imprints. Ethnic 78s are one of the focal points of UCSB’s collection and the library recently acquired a large portion of Bastin’s collection, consisting of about 10,000 78rpm ethnic and folk recordings from Latin America and Europe, as well as recordings in popular traditions, such as the Argentine tango. This disc is one of hundreds of similar recordings from continental Europe in the collection that falls outside the conventional boundaries of European classical and popular music. Note: The French Fremeaux company offers an entire CD of early Péguri recordings which is currently in print. It contains a version of Piétro which may or may not be the same one offered here (we were unable to locate a copy in time). Regardless, we still thought it was important to highlight this important early recording and label.